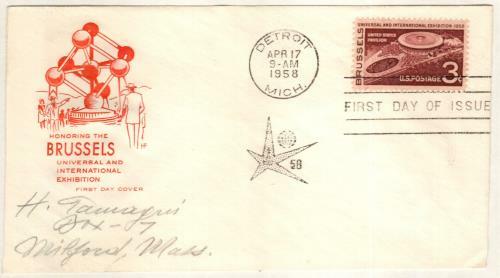 US #1104 – Classic First Day Cover. Since 1855, Belgium had a tradition of holding large national celebrations to commemorate its independence following the 1830 Belgian Revolution. However, the prime minister decided to skip the 1955 celebrations to provide additional funding for the world’s fair in 1958. A total of 15,000 workers would spend three years building the 490-acre site. They reused several buildings from the 1935 expo, which had been held on the same site. In the wake of World War II, Expo 58 was intended to help Europe and the world, look toward the future. Participating nations were encouraged to showcase their best technological advancements as well as their unique cultures. Each of the 51 participating countries built their own futuristic pavilions, showing their hopes for the future. 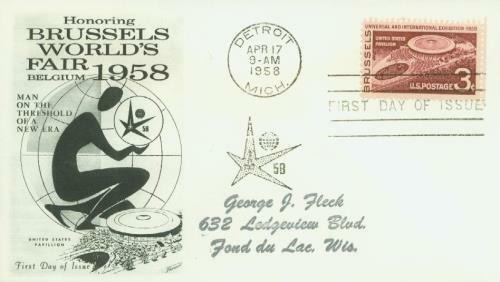 US #1104 – Fleetwood First Day Cover. The fair officially opened to the public on April 17, 1958. The most memorable display was the Atomium, a giant structure built to resemble the cell of an iron crystal magnified 165 billion times. It was made of nine connected metal spheres. The structure remains open to visitors. The American pavilion consisted of four buildings with displays and activities showing the “American way of life.” This included color televisions and popular treats such as ice cream and Coca-Cola. They also had a fashion show, an electronic computer, and a performance by the Seventh Army Symphony Orchestra. 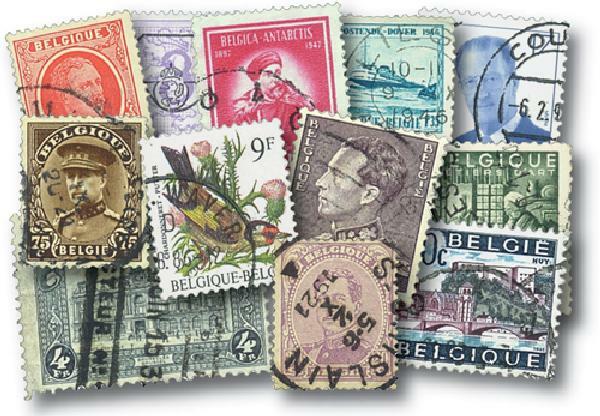 Item #M3096 – Get a collection of 300 Belgium stamps for under $10. 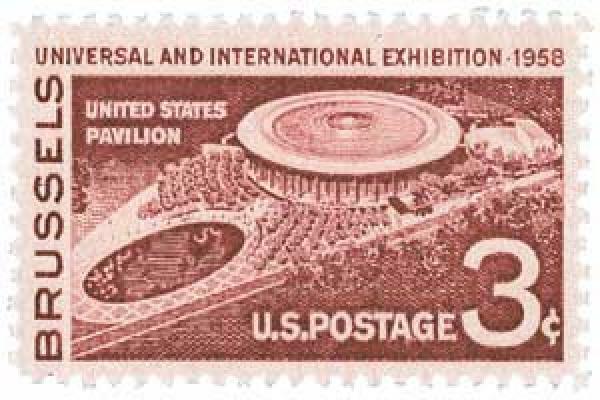 The Soviet pavilion was placed right next to the American pavilion, to showcase one of the expo’s major themes – peace and prosperity among nations. Though there was clear tension between the two groups. The Soviet pavilion included a towering statue of Lenin and replicas of their successful Sputnik satellites. One of the more controversial exhibits was the recreated Congolese village, also called the human zoo. The village consisted of 700 Congolese people, put on display behind an armed guard. While some visitors praised the exhibit for its accurate portrayal, the Congolese protested the way they were treated by spectators and demanded they be sent home. 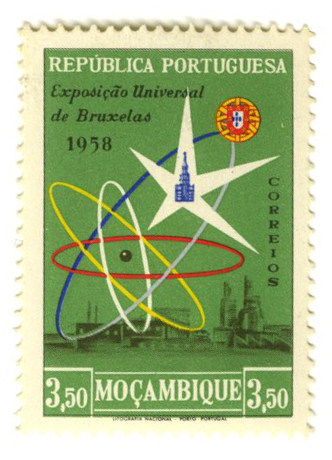 Mozambique #403 was issued for the expo. The expo also included the worlds first universal film poll. Critics from 26 countries nominated films and then voted on the best of them. Among the top choices were Charlie Chaplin’s The Gold Rush, D.W. Griffith’s Intolerance: Love’s Struggle Through the Ages, and Orson Welles’ Citizen Kane. The expo officially closed on October 19, 1958. During its six-month run, the fair had hosted over 41 million visitors from around the world. Click here to view video from the expo. 2 Responses to "This Day in History… April 17, 1958"
Interesting post. I did not realize that it was the first World’s Fair after WWII. As a Baby Boomer, despite constantly seeing WWII movies, TV shows with those themes, (skipping the 3 years of the Korean war) reading books and collecting stamps, it did not occur to me until much later in life and living in Europe for several years in the 70s (where war damage was still evident in many places) and again after 9/11, that the war was only 15 years before John Kennedy became President. For an entire generation of people, the physical devastation of Europe, the millions of displaced persons, and what happened during those 6 years were ever present in their minds as the most significant events in their lives. I look back at Vietnam, Desert Storm, Somalia, and often think of how recent were my experiences, until I look in the mirror and see an old white haired Soldier married to a white haired former Army Nurse. Nest stop…New York Worlds Fair 1964-1965. Hemisfair 1968, Expo ’70, and then what happened to World’s Fairs? When my Dad was stationed in Germany we went to the Brussel’s fair and I remember it was awsome to this nine year old, especially the Atomium. We have tons of slides I’m putting on cd’s to preserve. Still cool even after all this time.